Alexei Gorokhov was born in Moscow on Feb. 11, 1927. He studied at the Moscow conservatory where his main violin teachers were L. Tseitlin and A Yampolsky. In addition to his violin studies he also received a degree in Musicology. Achieving prizes at several international violin competitions he toured extensively in the Soviet Union as well as in Germany, Poland, Denmark, Sweden. Rumania, Portugal and Korea. 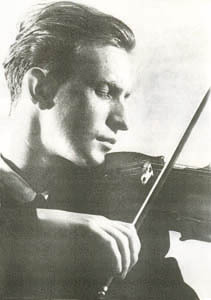 In 1957 he became a professor of the violin at the Kiev conservatory. He has recorded numerous violin works, among them: the concertos by Beethoven, Brahms, Tchaikovsky, Mendelssohn, Paganini, and by Victor Kosenko. Alexei Gorokhov passed away on Feb. 3, 1999.